Not sure how many of you tuned into the live webcast of the 2010 F/W runway show of Burberry Prorsum but if you didn't you surely missed out. First those boots came strutting down the runway and my mouth fell open a little, then I saw those gorgeous coats and that was it. Flies could have flown in my mouth- it was hanging wide open and I was drooling. My only problem with Christopher Bailey's Burberry collection was what coat did I like more? Every little detail in this collection is perfect and the color palette is gorgeous! I loved the big purses and the little bags. The white shearing coats at the end were amazing. The whole time I kept wishing there was a rewind button on the cast so I could go back and see more of the outfits. Of course the front row was lined with celebrities- from Anna Wintour, Mary Kate Olsen, Kate Hudson, Kristen Stewart, Claire Danes just to name a few. I so wish I lived in NYC at times like this when the show was live streamed in 3D to an invited audience! How freaking cool would that have been. Ugh- maybe next time? Anyways, enough of me proclaiming my love for this collection. Take a look at a few of my top favorites. 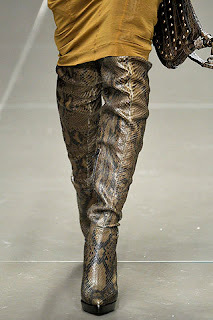 And these boots- my god- if only I had legs like these girls! I have a weakness for snake skin! Don't get me wrong I love snakes- but their skins are amazingly detailed. 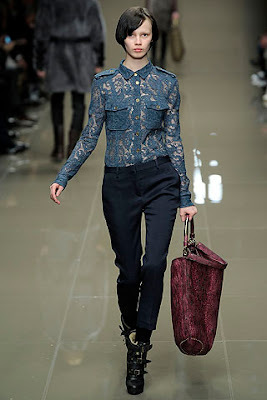 So what do you think of the 2010 F/W Burberry Prorsum collection? The entire collections was so beautiful. I want those boots too! 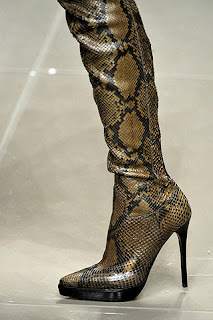 And my fiance had snakes as pets, and I still want to make them into a killa pair of boots!